The property at 26 Morningside Drive South in Westport was owned by artists Naiad and Walter Einsel. 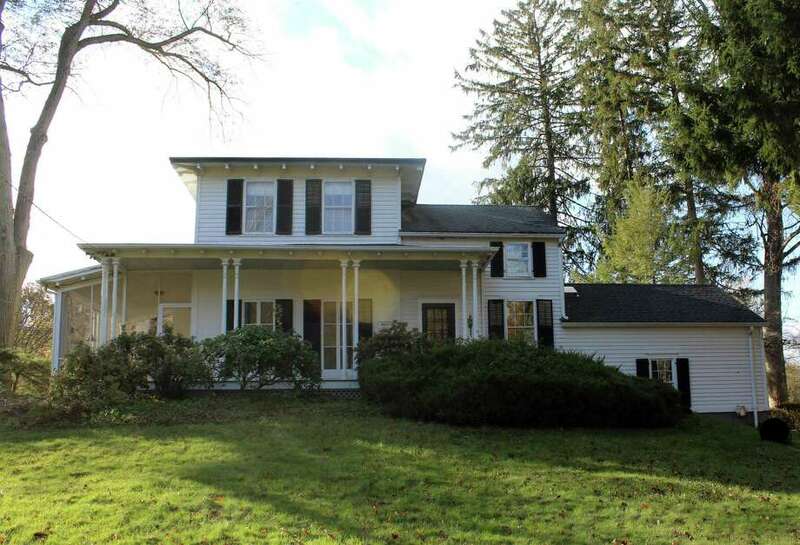 WESTPORT—Naiad Einsel admired the mid-19th-century farmhouse across from Greens Farms Elementary School when she and her husband, Walter, summered in town during the 1960s. When the house came on the market, the couple, then living in New York City, purchased it, and in 1965, moved their family to the property. Both prominent artists well-known for their commercial design work and kinetic sculptures, including the creation of the Merrill Lynch logo and stamps for the United States Postal Services, the Einsels helped set the town’s reputation as a creative community. “They were the face of the Westport artist colony. These people were it. They were the first couple in the Westport arts community and their house was a wonder,” Morley Boyd, a historic preservation activist in town, said. In 1998, at age 72, Walter Einsel died. Nearly a decade after Walter’s death, Naiad requested Local Historic Property Status from the Town of Westport in an effort to protect the historic character of the buildings and property. The town’s Historic District Commission voted to approve Naiad’s request and, in 2007, established the 20 and 26 Morningside Drive South Local Historic District. The Einsels subdivided the lot, according to Henkels, into two parcels, 20 and 26, in the years prior knowing money wasn’t always steady in their chosen artistic profession and wanting to account for the possibility that they may one day need to sell the 20 parcel, which does not include the farmhouse. Nonetheless, Naiad ensured both properties were covered under Local Historic District status. “I think they used the land and the setting as a statement of themselves and I think that’s also what she wanted to preserve,” said Carol Leahy, the Historic District Commission staff administrator and coordinator. In 2016 Naiad died, and shortly thereafter, the 20 Morningside property was sold to Emil Fish for $1.5 million and then transferred to Morningside Drive Homes LLC and then Greens Farms Developers LLC. Fish also bought 26 Morningside for the same price of $1.5 million and transferred ownership to Morningside Drive Homes LLC. Now, Greens Farms Developers want to build a new residential home on 20 Morningside and they’ve received substantial backlash from residents of Greens Farms and members of the Historic District Commission which, due to the property’s status as a Local Historic District, have jurisdiction to approve changes to the property. At the Nov. 14 HDC meeting, representatives of Greens Farms Developers LLC presented several variations of a new construction home for 20 Morningside that members of the HDC criticized to such an extent that the representatives withdrew the submission. Annette Perry, a project manager with Greenwich-based Grand Development LLC, was hired by Greens Farms Developers to represent the application to the HDC and said the owners withdrew the proposal but planned to resubmit a new design. The new home design was resubmitted and the Perry and her team will again appear before the Commission at its meeting next Tuesday night to ask for a “Certificate of Appropriateness” for the proposed new construction, driveway, fencing and lighting fixtures at 20 Morningside. While Perry insists the proposed house on the 20 property must be looked on separately from 26 Morningside, Henkels says any changes to the property needs to be evaluated in conjunction with the other plot due to the two properties’ status as a combined Local Historic District. What it comes down to is whether the Historic District Commission has the power to completely halt development in a district over which it has authority regardless of whether developers bought the property with the assumption that it could be developed. Either way, the decision the HDC makes in regards to development at the 20 property will set precedent for development at further properties classified under historic district status. The HDC will meet Tuesday, Dec. 12 at 7 p.m. in Town Hall Room 201/201A to discuss a verdict for future development on the Einsels’ old property.